Shakshuka: Expat food at its best! It’s a dish of eggs poached in a sauce of fresh tomatoes, chili peppers, and onions, often spiced with cumin. It is overlaid with Sephardi flavors. The dish has become so popular you can find it in virtually every casual restaurant, at any time of the day. Umami and ethnic flavors at their best! So pretty and so fragrant. Watch them all mop their sauce with pita or crusty bread! Saucy and messy deliciousness. It’s in my Whole Foods Cookbook! Egg dishes are satisfying enough to make a whole meal. Look at my Frittata Recipe, another wonderful egg-centric meal. Gone are the days when eggs were blacklisted: too much cholesterol and whatnot. The same lame reason we replaced butter with margarine for so long. Thank goodness those insipid days are gone! You are having eggs, so you are having less or none of another protein: In other words, you’re doing OK! Eggs make a welcome appearance on toast, in soup, in salads, boosting a simple dish into a satisfying and nourishing main course, at a modest monetary and labor cost. The incredible edible egg is the popular food prop now, and I hope it lasts this time! Go away boring and fickle food trends, we don’t like you: You get everybody confused! Shakshuka has been around for ever! Who knows why it has recently become so popular all over the world? Who knows what brings modest native dishes into the limelight? It is true that we are exploring more with our foods and we are less shy with our flavors. We grew up eating it regularly. Although the most common version is dominated by tomatoes, you can make it in many more exciting ways, including without any tomatoes at all. All green, even all white! Wow, who knew? Oh yeah, can I interest you in my amazing Mushroom Eggplant Shakshuka too? You want eggs with creamy to runny texture. So make sure they go in toward the end of cooking, or you will end up with an uninspired hard-boiled texture. Scroll down for all variations! Start with the basic recipe, then take it places, for Breakfast, Lunch or Dinner! Heat the oil in a large skillet with sides. Add the onion and garlic and saute until fragrant. Add the tomatoes, jalapenos and spices, and cook covered on a gentle flame for about 20 minutes. Make a little well in the mixture, and with the space you just made, put in one egg. Repeat with all other eggs. Cover again and cook a few more more minutes, until they are barely set. Divide the Shakshuka among 4 plates, and be sure to use up all the sauce. Serve hot, alone or with a good whole-grain bread, or on a bed of cooked (canned OK) white beans. Play with your seasonings. Curry, Herbes de Provence, Rosemary, Thyme, Basil. Short selection please. 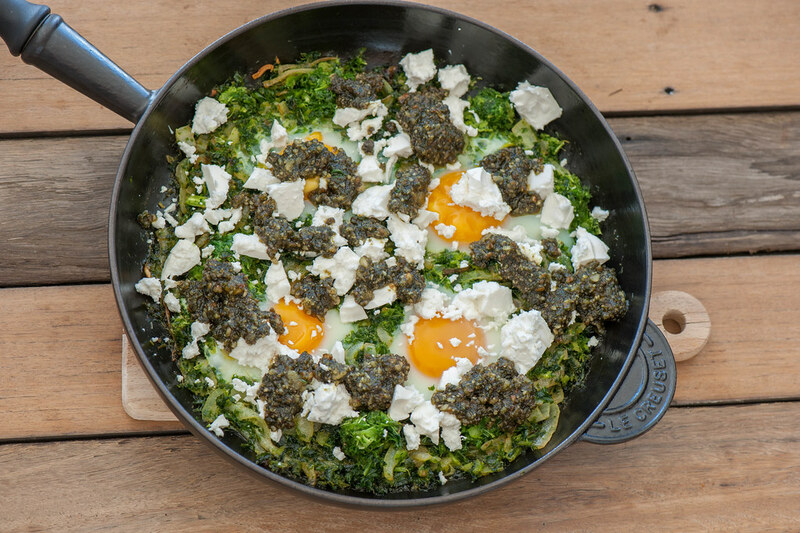 Make a green Shakshuka: Omit the tomatoes, or use just a couple, and use chopped spinach, Swiss chard or kale leaves. Frozen OK. Don't be shy, pile it on. Here you need to replace the moisture that tomatoes naturally provide in regular shakshuka. Use a little water or milk; coconut milk is wonderful here and will make a wonderfully creamy mixture. Make a dairy Shakshuka, by adding cubed feta or shredded cheddar. In this case omit the salt. How about a white Shakshuka? white cabbage and potatoes, and a ricotta cream sauce? Amazing! You want even MORE poetic license? Try my amazing Mushroom Eggplant Shakshuka!